Ever since Adam and Eve, snakes have gotten a bad rap. Even Noah, the bearded gentlemen, left snakes off the guest register when the Ark set sail. Snakes are the Rodney Dangerfields of the reptilian world - they dont get no respect. So it is no wonder when a snake is sighted most people run for a shovel. As the warm weather melts away the cool of Spring, snakes emerge from their winter hibernation and disperse. It Is a wondrous sight to see a ball of snakes emerging from their winter den, all tangled together like a ball of yarn. As each snakes body draws more heat from the environment, the snakes peel off into separate individuals. The party is over for these communal winter den mates, with rattlesnakes, racers and whipsnakes going they separate ways. Some common snakes in Canyon Country are western terrestrial garter snakes, midget-faded rattlesnakes and gopher or bull snakes. Of the three, the rattlesnake is the only representative Viperidae, or Pit Viper Family. And no matter what any guide says on a river or jeep trip, rattlesnakes are not encouraged to coil up on your sleeping bag drawn there by the steady rhythm of your heartbeat, so stop sleeping on the roof of your car. The later two are members of the Colubridae or Colubrid Family. Colubrids are common, generally harmless snakes found on all continents of the world, except Australia. Members of the group can be found from sea level to 9,000', and in habitats as diverse as lowland wetlands to coniferous forests. One noted feature of this group is that many Colubrids slip into burrows and crevices or may climb trees and sandstone ledges in search of prey. The gopher snakes body is a yellow or cream-colored background blotched with dark brown or black spots. This pattern enables the gopher snake to blend into its surroundings. But when its four-foot body tries to cross the pavement - watch out. 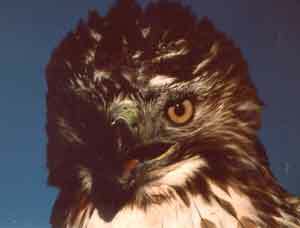 Soaring red-tailed hawks and road hunting kit foxes or coyotes have been known to pick off these slithering denizens of the desert. Some nights, when I was rangering at Arches National Park, Id catch a kit fox in my cars headlights as it scooted across the road dragging a lifeless snake. Gopher snakes are tough creatures, but sometimes they need to rely on mimicry to get themselves out of tight spots. When really agitated, the snake will coil itself up, hiss and vibrate its tail - too bad there arent any rattles on the end. With a somewhat triangular-shaped head, reminiscent of the vipers, the gopher snake fools the unsure predator with its behavior. Maybe the predator backs up to think the situation over, and this brief pause may provide the snake with the opportunity to escape. 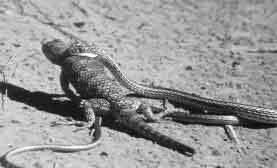 A lucky observer might catch two gopher snakes moving together in a syncopated dance which may last for an hour. This is not a courtship ritual between mates, but rather a combat engagement between rival males that features head rearing, hissing, slithering with upraised heads and Grecian wrestler moves. Often the snakes are so absorbed in their activity that they fail to notice the onlookers, two-footed or four. Not a good practice considering the reputation these reptiles bear on their small shoulders. 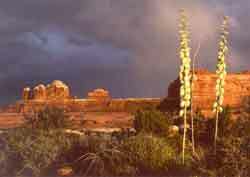 © 2001 Moab Happenings. All rights reserved. Reproduction of information contained in this site is expressly prohibited. © 2002-2003 Moab Happenings. All rights reserved. Reproduction of information contained in this site is expressly prohibited.